SOUTHINGTON - It didn’t take long for Southington head football coach Mike Drury to tell his team to line up and run a play. In other words, it was back to business as usual for the eighth-ranked Blue Knights (7-0), a big win last week or not. Any thoughts about the Enfield matchup tonight - one that got pushed up a day - being a hangover game, Southington made sure to dispel those notions, especially with the way the East Hartford game started. Last week, the Blue Knights were forced to erase two 14-point deficits before closing out the game in the final minute of the fourth quarter. The Eagles, however, are not the caliber of team the Hornets were. Enfield (3-4) comes into the game on a three-game losing streak and hasn’t been able to score more than 27 points in any matchup since the season opener. On the season, the Eagles are averaging just 21.1 points per game. That number drops even lower to 16.2 if their 51-point outburst in Week 1 is taken out. But in typical Southington fashion, the Blue Knights are treating tonight’s game as if they were playing against East Hartford or New Britain. Enfield is improved from when the two teams met last year. The Eagles have already tripled their win total after going 1-9 in 2017 and still have a few playmakers that have been able to hurt opponents on occasion, most notably quarterback Cody Stager and wide receiver Joel Stewart. Through the first six games this season, Stager has completed 52.9 percent of his passes for 1,091 yards and 13 touchdowns to just four interceptions. He’s also the team’s leading rusher with 200 yards and two scores on 78 carries. Stewart is often the quarterback’s go-to target. Through six games, the wideout has 596 yards and seven touchdowns on just 27 catches (21.1 yards per catch). After Stewart, Stager will normally look toward Wyatt Raymond, who has 22 catches for 362 yards (16.5 average) and five scores this season. After those two, the production drops off. Southington’s offense, meanwhile, is looking to continue to execute at a high level in terms of run-pass balance. 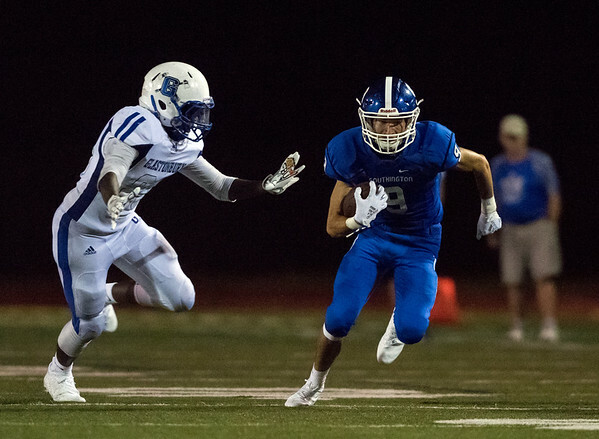 Against East Hartford, the Blue Knights ran for a season-best 245 yards, making it the first time all year they collected more yards on the ground in a game than in the air. Tanner LaRosa ran for 210 of those yards and two touchdowns on 22 carries, thanks to some of the holes center Ethan Agli, guards Jacob Vecchio and Owen Bouchard and tackles Sam McCarty and David Sullivan were able to open up. The group could get another good opportunity to showcase the line’s ability, with Enfield liking to be aggressive on defense as well as liking to employ multiple looks up front. Drury said last season the Blue Knights saw three different lineups from the Eagles. As always, the level which Southington performs at tonight will be determined by how much attention it pays to those little details. Posted in New Britain Herald, Southington on Wednesday, 31 October 2018 21:33. Updated: Wednesday, 31 October 2018 22:00.